DIOPSYS provides unique platforms for their advanced suite of visual electrophysiology modules. 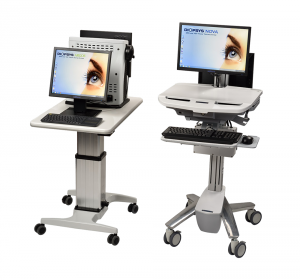 The Diopsys® NOVA™ (cart) and Diopsys® ARGOS™ (tabletop) ERG and VEP Vision Testing Systems allow to perform multiple visual electrophysiology tests in a clinical practice. Objective measurement of retinal function. Reports and documents the results of treatment and disease progression for enhanced patient amangement. No verbal response or "button pushing" by patients. Better management of cataract patients with retinopathies. Data helps eye care providers better manage patient expectations for IOL procedures. Documents the results of practitioner intervention for enhanced disease management. Ratanapakorn, T, et al. Effect of cataract on electroretinographic response. J Med Assoc Thai. 2010 Oct;93(10):1196-9. Visual Electrodiagnostics: A Guide To Procedures. International Society for Clinical Electrophysiology of Vision (ISCEV Publications) Web. 17 Jan. 2017. Talamini CL, et al. Abnormal multifocal ERG findings in patients with normal-appearing retinal anatomy. Doc Ophthalmol 2011;123(3):187-192. Hood, DC, et al. ISCEV Standard for clinical multifocal electroretinography (2011 edition). Doc Ophthalmol 124:1–13. Oner et al. Pattern electroretinographic results after photodynamic therapy alone and photodynamic therapy in combination with intravitreal bevacizumab for choroidal neovascularization in age-related macular degeneration. Doc Ophthalmol. 2009 Aug;119(1):37-42. doi: 10.1007/s10633-009-9167-8. Naismith et al. Optical coherence tomography Is less sensitive than visual evoked potentials in optic neuritis. Neurology. 2009 Jul 7;73(1):46-52. Simon J, Siegfried J, Mills M, Calhoun J, Gurland J. A New Visual Evoked Potential System for Vision Screening in Infants and Young Children. Journal of AAPOS. 8.6 (2004): 549-554. McKerral et al. Visual and Cognitive Information Processing after Traumatic Brain Injury: VEP and ERP Studies. Invest Ophthalmol Vis Sci 2002;43: E-Abstract 1803. Patient in front of a Diopsys® NOVA™ system during a Diopsys® VEP vision test.